The neighborhoods around us are pretty crazy when it comes to Christmas lights. They aren't necessarily obnoxious (well, save for a few out of control houses! ), it's just that people really decorate. There's one nearby street that calls itself "Candy Cane Lane" and the decorations on their street extend beyond their own yards and involve giant sand sculptures of Santa's face, lights strung across the street, and music playing at all hours! We're a little behind when it comes to outdoor Christmas lights. As in, we'll have them next year. We said the same thing last year, but really, next year is the year! The inside of our house is all decked out, the outside just hasn't caught up yet! Besides, I'd rather get festive in the kitchen! 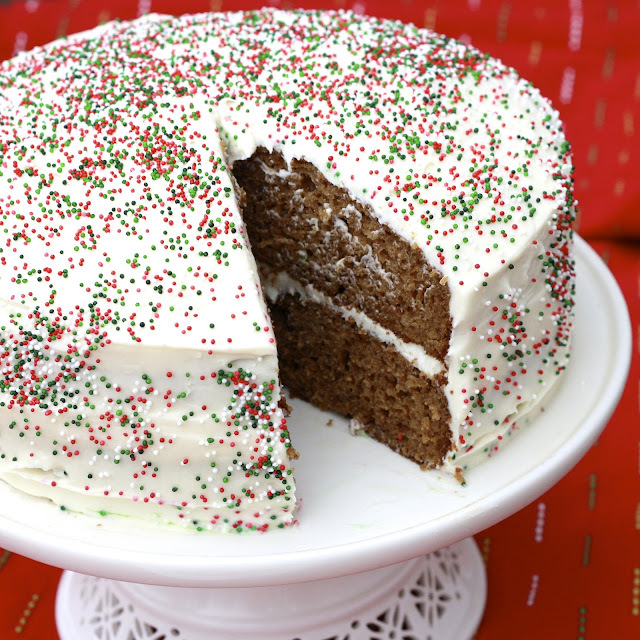 This ginger cake was just the thing to help me celebrate the season the best way I know how. If you like gingerbread, this cake is for you! 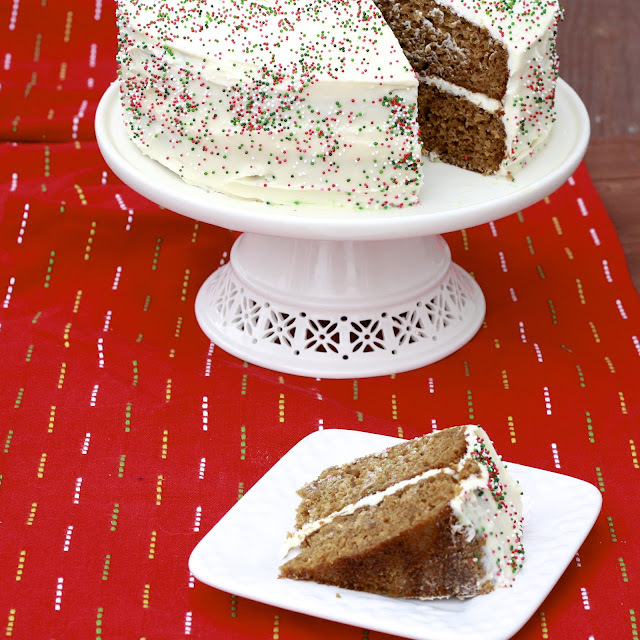 If you love gingerbread, quick reading and start making this cake! 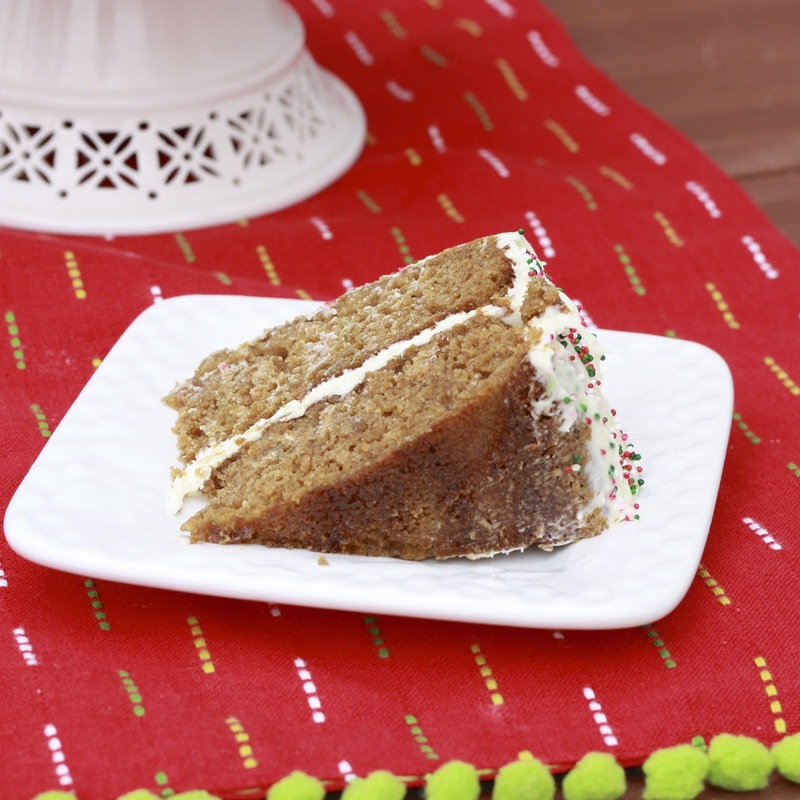 This has all the flavor and spice of gingerbread, but it's not crunchy or hard like gingerbread sometimes is. In fact the cake practically melted in my mouth. Paired with a maple cream cheese frosting, this was downright dangerous. I brought it to our church's holiday dinner along with a few other desserts and decided I could not be trusted with the leftovers. Thankfully I had sisters and sisters-in-law to share the love (handles). 'Tis the season for Christmas cookies, but this would be just the thing for your Christmas dinner dessert! 1. Preheat oven to 350F. Line two 9-inch pans with parchment paper and grease well. 2. In a large bowl, whisk together buttermilk, oil, eggs, sugar, and applesauce, stirring until smooth. Sift dry ingredients into a separate bowl. Add dry ingredients to wet, stirring until combined. 4. To make the frosting, beat cream cheese and butter until smooth. Add maple syrup, vanilla, and confectioners' sugar and beat until smooth. 5. 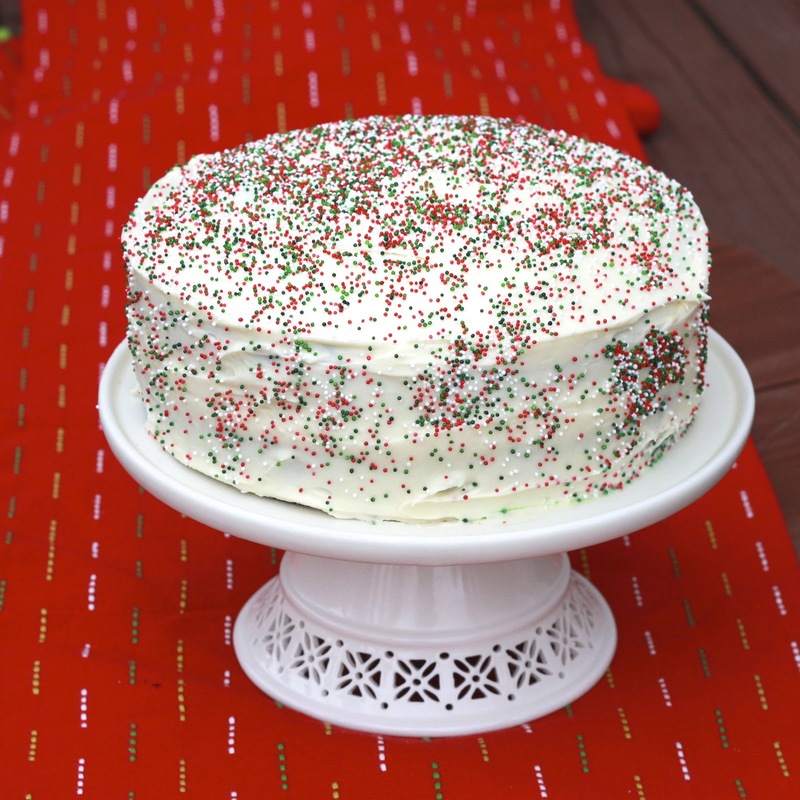 To assemble, place one cake layer on plate. Top with 1/2 cup frosting and spread evenly. Top with second cake layer and use remaining frosting to cover top and sides of cake. Decorate as desired.